The Information War over the Urumqi Riots and the “Netizens” of China: Are we witnessing the dawn of a new era in Han Chinese nationalism? Anybody who has recently attended an event where the policies of the Chinese government towards minorities are being criticized has encountered the propaganda shock troops of the new China. They protest nearly every public event involving the Dali Lama in the United States, they established counter-protests against Tibet during the Olympic torch relay last summer, and they were at my talk about the post-9/11 plight of the Uyghurs at Georgetown two years ago. At public events, they protest, hand out pro-China information, and defend China’s minority policies, but they have an even larger presence on the web where they more easily push their agenda using the free speech forum of new media. Look at any article about the events in Urumqi from the last week, and you will see scores of comments from them, noting that these events are purely an unprovoked act of violence by savage Uyghurs. They overwhelm the #urumqi and #xinjiang discussions on twitter. And, they have been diligently attacking any youtube videos of Rabiya Kadeer with deriding comments about her for several years now. Their message is that China is doing everything right for its minorities, and anybody saying otherwise is part of an externally masterminded conspiracy to undermine China’s sovereignty and growing prosperity. These people are not like the shadowy commentators you see placing incendiary comments on Central Asian or Russian sites most likely at the bequest of the successor organs of the KGB. If this phenomenon was just a conspiracy that emanates from the Chinese state, it would not be so disturbing. Rather, the propaganda shock troops about whom I am talking are regular Chinese citizens. They are also not the most reactionary ones. They are often studying abroad in the west and have been exposed to the world. Still, their commentary suggests that they are extremely patriotic about China, feel misunderstood and wronged by the west, and do not harbor any sympathy for the plight of minorities in China. This is particularly disturbing for the many who have hoped that China would embrace democracy as a new generation of Chinese encountered the outside world. These propaganda shock troops appear to be the new generation, and they do not look like the pro-western liberals that western policies of engagement had foreseen. Instead, they are more like a new Red Guard, reminiscent of student groups during the Cultural Revolution, who want to demonstrate their grassroots support of the state through their computer keyboards instead of waving Mao’s little red book in the air. I am sure many of my China studies colleagues would cringe to hear me writing about this, feeling that it adds to a growing western “China-bashing” phenomenon. But, please do not misunderstand my point. I am not trying to “essentialize” the Chinese people as narrow-minded, aggressive, and dangerously nationalistic. I do think that there are intelligent and progressive young Han Chinese who are struggling with these issues and are questioning the appropriateness of their state’s policies towards minorities, but such people appear to be in the minority at the moment. Furthermore, I do not blame the people of China for this phenomenon. They have been spoon-fed this growing nationalism by the state ever since Tiananmen. What may be most worrisome about this trend today, however, is that the PRC itself is starting to recognize these grassroots propagandists for their service to the state. In two recent articles, the China Daily applauded Chinese “netizens” for criticizing western media coverage of the Urumqi riots and for calling for the closure of Facebook in China respectively. Such articles certainly encourage this phenomenon and suggest that the Chinese government supports even its most racist manifestations. It also suggests that the Chinese state refuses to recognize that there might be socio-economic and political reasons for the dissatisfaction that most Uyghurs and Tibetans share with regards to their lives in the PRC. police, Uighurs get ridiculous advantage in college entrance exams. shut off by the government. Sound familiar? Replace “Uighur” with “black” or “Mexican” and “Han Chinese” with “white American,” and this statement will look almost indistinguishable from the rhetoric of American opponents of immigrants and affirmative action. Fortunately in the United States, our political system has a degree of self-correction. After eight years of conservatism where such rhetoric was gradually becoming acceptable, we now have our first African-American president and the tide is turning the other way. The Chinese political system does not have quite the same ability to correct its radicalization, and it will likely be a long time until we see a Uyghur leader of the PRC running the country from Beijing. What worries me is that instead of correcting itself, this trend is becoming more pronounced in China. This is also apparent in the emerging debate among Chinese intellectuals about the Urumqi riots, which suggests that China has been too soft on minorities and must be more forceful in its control of restless populations such as the Uyghurs and Tibetans. The populist manifestation of these sentiments is even more frightening as we saw in the Han vigilante groups on the streets of Urumqi this last week. This alarming trend does not bode well for China’s on-going attempt to ingratiate itself to the international community, and it will only likely exacerbate the problems in Xinjiang as Chinese citizens show an unwillingness to re-evaluate why Uyghurs are so dissatisfied with Chinese rule. 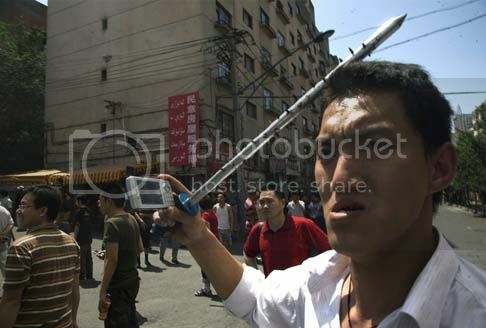 There are certainly several different lessons China can learn from this week’s violence in Urumqi. It might choose to view the situation as a state of war in the way that the Israelis have done with the Palestinians (at least one Israeli commentator has drawn this parallel in his empathy for the Chinese), and – as with the Israeli-Palestinian conflict – the tension in Xinjiang will continue to fester and become even more violent with time. Alternatively, it could heed these events as a sign that things must change in terms of minority rights as the U.S. realized after African-American led riots destroyed cities throughout the country in the late 1960s. The path China chooses will have important ramifications for the country’s future. I do believe that China can change. I believe that China could empower Uyghurs to have a greater voice in how development proceeds in Xinjiang, including the prospect of real ethnic autonomy. But, as I look at the commentary of Han “netizens” that floods the internet these days, I am worried that such changes are not likely in the near future. Instead, the near future will probably only bring deeper ethnic divides, more frustration among minorities, and – most unfortunately – more bloodshed. I don't wonder why these Chinese netizen's reacted in the way as they did even if they have been receiving western education, because these people are grown up by lies of CCP and brainwashed. Even if they seem to be very modern (as they called themselves, very ridiculously), in fact they have very mean thought and can't accept that people are different and have different opinions and minds. If we look at the incident in Guangdong which sparked the Urumqi protest , these so called nitizens had shown no sympathy to the died and injured Uighurs who happen to be there because of forced migration of Uighurs (pls look at http://www.youtube.com/watch?v=N2J3tJeU0lc). This, essetially, shows how evil and uncivilized these modern netizens are. In my opinion, if these Chinese could learn from the Urumqi protest and acccount their government for the corruption and injustices which are happening elsewhere in China, the whole society would have been a better place for both the Chinese and minorities. Until they learn the meaning of dialogue under mutual respect and acceptance of different viewpoints and ask themselves why other people don't like them, the plight of the minorities can't be solved. You claim to be a supporter of democracy, yet you cannot handle opposing viewpoints. You're not being manhandled by these people, take it like a man! It's interesting how supporters of the CCP/PRC are always labeled as brainwashed, accused of being paid, and their views dismissed as propaganda. Why isn't there any debate with the arguments they bring forward? I am not sure if your comment is directed at me or the previous commentator. If it is directed at my post, I think you have missed the point. I did not suggest that people are being paid or that they are creating propaganda. To the contrary, I was expressing alarm at the grassroots growth in Han nationalism in China. In fact, many Chinese netizens have been critical of the government for being too soft on minorities. I am afraid such attitudes are more likely to exacerbate ethnic tension than to resolve it. My comments were directed at China bashers in general. One man's patriotism is another man's nationalism. Your choice of words is interesting. You say China "nationalists" are inflaming tensions with their rhetoric, yet you say you are "impressed with Turkey standing up to the plate on the Xinjiang unrest" in Twitter. Were July 5th events really genocide? I'm afraid your attitude will definitely exacerbate ethnic tensions than to resolve it. Anonymous netizen - I respect your opinion. Justice - the major hole in your argument is the former Soviet Union. the Uyghurs historically, culturally, and linguistically are extremely close to the Uzbeks. Yet, during Soviet times, the Uzbeks rarely resisted Russian rule after the 1930s. This, in fact, is what interested me in the Uyghurs to begin with. While studying in Uzbekistan in 1989, I was amazed at how comfortable most Uzbeks were with the Soviet Union (contrary to what many American Sovietologists were writing). On traveling to Xinjiang during my winter break, however, I was amazed at how different the response of Uyghurs was to Chinese rule. The independent variable in this equation was not Islam, but the style of state-rule. Were July 5th events really genocide? Yes, it was!!! and The Genocide has been going on for the past 60 years. First was pan turkist, pan islamist, anti revolutionary, then cultural revolution, then continuous testing of Atomic bombs (46 times), then forced birth control, then so called three forces, then Shaoguan, Urumqi killings ......more, how many million Uyghurs are displaced, exiled, executed? What do you wanted to do more in order to call it Genosice in your terms? If you nationalist Chinese or whatever Chinese want to live in peace and harmony, why you come to ET, just go home and do your business there, nobody welcomes you there. If you go to someone's room and want to become the boss eveybody would not allow that and kick you out or kill you. (but you are doing this in ET by relying on your army and weapons). Thank you Dr. Roberts for bringing some fresh thoughts to this issue. The pro China netizens and counter protestors you mentioned bring to mind what I have heard called “Chinese Inferiority Complex”. I don’t recall who coined the term CIC (which I think is a very poor name for the theory), but I imagine you are familiar with the concept: China has long suffered at the hands of the West and Japan—from the port cities established by European nations and culminating with the Japanese massacres of WWII. Having lagged behind these same nations developmentally for the last century, and finally feeling some economic and political clout of their own, the Chinese don’t want to be pressured by the same countries whom they see as having hurt or, maybe, abandoned them. Most importantly, there is a nationalism that has come out of this collective humiliation. I have seen plenty of journalism in the West that smacks of anti-China rhetoric, and this fuels the nationalism you've discussed, but it seems the western coverage of this event has been fairly evenhanded. It is interesting to see this event get so much media attention. The plight of the Uyghurs has long been marginalized by Western media, especially when compared to the coverage of Tibetans. Much of that probably has to do with having a charismatic leader. Can you shed any light on the feelings in Xinjiang following the Iranian election protests? It seems like the events in Tehran would have been motivating and empowering to Uyghurs and a contributing factor to the Urumqi riots. Finally, is there any precedent in less developed countries for the devolution we hope to see in Xinjiang and Tibet? That is, are there instances where governments have willingly ceded power to states/regions? This is Justice. Could not load under that username. Thanks for your input. I agree that you may have personal experience with the Uighurs but from what I know the former Soviet Union ruled with an iron fist. Upon its breakup muslim provinces rebelled against their ruled e.g Chetnya.Whereas China has chosen the path of an open economy where religions are allowed to be practised more openly.Thus people are more daring to voice out their opinions.Thus your views on how the state rule its citizen may hold water. However state rule may be one of other factors. I would still hold to my opinion that the underlining issue is religion because I have not seen any countries where muslims have not rebelled or protested against non-muslim administrations e.g riots in France, beach fighting in Australia, separatist movement in Thailand and Philipines, Rohinyas objection to be ruled by Myanmar, civil war in Lebanon, terrorism committed mostly by muslims. China is only trying to administer its country according to its doctrine. Even in the USA, immigrants have to adapt to the american culture whether they are Irish, Italians, Chinese, Japanese etc. From what I know most of these immigrants have lost their original identity because they are Americans. 1) I believe that the Iranian protests may have served as inspiration for the initial protests in Urumqi, but we do not know for sure because the Urumqi protests do not have an organized political infrastructure behind them. In Iran, the protests were highly organized by a recognized political candidate and his campaign people and supporters. In Xinjiang, the Uyghurs have no ability to establish a legitimate political organization to challenge the status quo (such an organization would be deemed illegal in China). This, of course, is true of all people in China, but with the Uyghurs, even less formal expressions of political dissatisfaction are quickly repressed, often under accusations of separatism or terrorism. So - if the Uyghur protests were inspired by events in Iran, it would have been indirectly. People who had been scared to publicly express their frustrations saw people in Iran going on to the street to protest despite that country's general authoritarian nature and get international attention in the process. Uyghurs in Urumqi may have tried to do the same, but it was not, nor could have been, as organized as what we have seen in Iran where political opposition is at least nominally tolerated. 2) There are numerous examples around the world of decentralized governance that translates into local autonomy. Many of these examples, such as Indonesia and Malaysia, are in Asia. Furthermore, China itself is a particularly good example. Hong Kong is very much autonomous within the People's Republic and has more democratic governance and increased civil liberties in comparison with the rest of China. Your hypothesis about Islamic peoples living within non-Islamic states is supported by some scholars of Islam, but I also think it has some serious holes. To return to the Soviet Union, Chechenya is the only Muslim example in the Soviet Union where there was a substantial and active resistance movement to Soviet rule. Most other examples - the Baltic states, Ukraine, and Georgia - were not Muslim. The Central Asian states are often recognized for their reluctance to leave the fold of the Soviet Union in 1991. As a result, it is often stated that these states received independence by default when the Soviet Union was dissolved. Furthermore, the Soviet Union actually gave more autonomy to its minority groups than does China. This has been noted by several scholars who have looked at Soviet and Chinese "nationality policies." Soviet Republics,for example, had the right to secede per the Soviet constitution whereas the "autonomous regions" in China never have and still do not. This, of course, does not mean that a Soviet Republic could have easily done so prior to 1991, but it does suggest a certain consideration of autonomy that has never existed for minorities in China. Furthermore, your comparisons of the situation of Uyghurs in China to that of immigrants in the United States is misplaced. The Uyghurs are not immigrants - Xinjiang is their indigenous homeland (this is disputed by the Chinese state in terms of historical arguments about the "first people" of the region, but that can be done with any population - more importantly, the ancestors of today's Uyghurs have lived in Xinjiang for centuries). The Uyghurs are better compared to the many colonized peoples around the world who established independence in the 20th century or continue to seek independence. While there are many Muslim peoples among these examples, there are also many non-Muslim peoples. Take, for example, the Basques, the Irish, the Tibetans, the Baltic states, etc.). I completely respect your theory, and you are not alone in voicing it, but I think it oversimplifies many other factors and examples of non-Muslim self-determination movements in history and today. Excellent post - thank you for sharing your insights. A great article indeed and a very detailed, realistic and superb analysis, of these books, very nice write up, it is really a nice book, Thanks. You seem to have abandoned your readers and fans. Come back! Rather than muse endlessly on the prognostications of the Mayans and Nostradamus, I am ever struck by the prescience of George Orwell as the PRC today and especially with respect to it's relationship to the west and the USA is THE manifestation of that final sentence from that great and unrecognized book of History "Animal Farm". I am torn. I am offended at the obvious and heavy handed China bashing that is so often the bent of the N.Y. Times and western media, (as I assume it has roots in the yellow peril and other racist reflexes mentioned in this particular blog) but at the same time I react with an ALMOST equal amount of disgust at the mindless and just a hair shy of pathological patriotism that seems to inflict many Han identity Chinese. Their reactions are visceral and could be defined in many cases as psychotic at times. Unfortunately, for this "friend of China " that became interested in the language and culture from 10 years of age , I only see this as eventually wearing thin even the warm regards that many of us non Europeans have towards a fellow "sufferer of imperialism". That lost legitimacy and resultant suspicion and enmity is building and whilst China's ability to dole out the dollars gives it an ability to see smiles, I am not sure it would want to hear the mutterings made after it's back is turned and it has walked out of the negotiation room. I worry that "Han arrogance" may increase as there seems to be way too small and softly heard, those voices of introspection and self examination for this well wisher of all involved parties. All of this is complicated by just what is China? As it is at the moment and thru out the past 900 years it is more an Asian union as it has for significant periods of time indeed right up to 1910 been more often than not ruled by non Han. The Han that have followed have used this shifting definition to their benefit, never at a loss at pulling out old scrolls that point out their point of view. (not unlike Biblical claims on the holy land) In this case is more like whoever writes about it first owns it) Many times thou those lands that they think of as "Chinese" in the Han sense were part of greater consolidation under Turkic rulers (Mongol and Manchu) which gives no inheritable ruling role to a Han dominated society. It seems that the Han won few battles when engaged with non Han opponents. Its not so much that the Chinese loom over the borders of central Asia as it is the world looms around China. When are you going to start updating your blog? It is a great publication! I witnessed similar mentality that Prof. Roberts cites amongst Chinese Americans/residents working in the USA after both the Tibetan and Xinjiang protests. Instead of looking at those incidents as clear signs of minority dissatisfaction, and there are plenty to be dissatisfied with the Chinese rule in both Xinjiang and Tibet, the Han Chinese community living in the USA basically acted as brain-dead puppets for the communist regime. They are so nationalistic and arrogant about Han rights that they have no concern about human rights of the "other" people, the non-Han minorities living inside China. It is really sad. And this I say from my own interaction with folks that reported to me in my job, and other Chinese nationals I met over the last three decades in the USA. As a matter of fact, the more China is becoming a stronger party in the international arena, the more I see that haughty ultra-nationalism amongst the Han Chinese. These people are not like the shadowy commentators you see placing incendiary comments on Central Asian or Russian sites most likely at the bequest of the successor organs of the KGB. If this phenomenon was just a conspiracy that emanates from the Chinese state, it would not be so disturbing. Wow is very common to hear about conflicts in many countries, there is a feeling I think going too far about defending country interests. The Information War over the Urumqi Riots and the “Netizens” of China and it is really a good war, because from it so many knowledge do comes for peoples to gain. The Chines government is taking so hard risk to control to population and by it these are creating a problem to their localizes. The Information War over the Urumqi Riots and the “Netizens” of China is some thing not good to watch because it is for good thing but the way of it is not good and I think it should needs to be get finish. This site is excellent and so is how the subject matter was explained. I like that you are very honest.Thanks for sharing this information and hope to read more from you. This is alot of information about the Riots of China. When will this stop? First of all thanks a lot for the great and informative post. I have to admit that it was really interesting to read this your post about the rails development. Well I noticed that your website is full of various information about this subject indeed that’s why I have bookmarked your website. Thanks a lot one more time for the ability to express my own opinion and keep up publishing those great and interesting articles in the nearest future too. I like the design of your blog very much. It looks like a page from fairy tale. I’m really impressed! It will not succeed in reality, that's exactly what I think. Chinese are communist and their society is better, they don't need a change as there was changed previously. Very Impressive Writing it is , and yaa i got many things to know from ur blog .. thanks for the information . Thank you so much. I knew this had to be a simple task. Great sample! very much and concern on ray ban wayfarer 2012, ray ban wayfarer wholesale are highly recommended. Site's character and a great color match .. I will recommend your site to the other platforms. abroad education consultants do you want to study in abroad today or in the next intake. we are the best and top rated study abroad consultancies in india with good visa assurance.overseas education consultants in ameerpet we help you in filing the f1 visa for you in very less time. we are also help you with information needed to apply for the college university. Our Social Media Application Development Services is performed by the expertise developers trained in using all leading tools and platforms to develop the excellent social applications that meet our clients evolving business needs. very interesting blog post, thanks for sharing such a good blog.